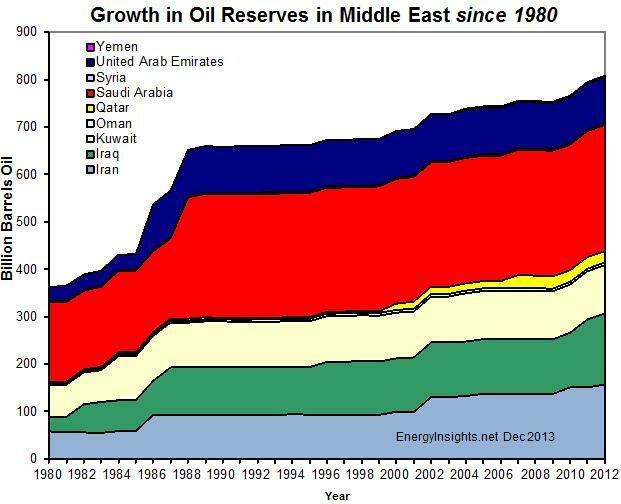 The Middle East continues to hold most reserves amongst the different regions. The USA too a massive jump up when oil prices rose an oil-shale deposits were found to be economic to produce at ~$70/bbl. Meanwhile heavy oil deposits in Venezuela and Canada became economic at >$50bbl around 2004. 2005 marked the end of "cheap oil" - remaining reserves will cost significantly more to produce than they did in the late 1990s when lifting costs were $0.5/bbl to $8/bbl. Most of the incremental new reserves coming on-stream have find-develop-produce full cycle costs of $30-$60/bbl - with oil selling for ~$100/bbl making these deposits economic. Looking at the different regions, you might be surprized to see how little oil Asia/Far East has. 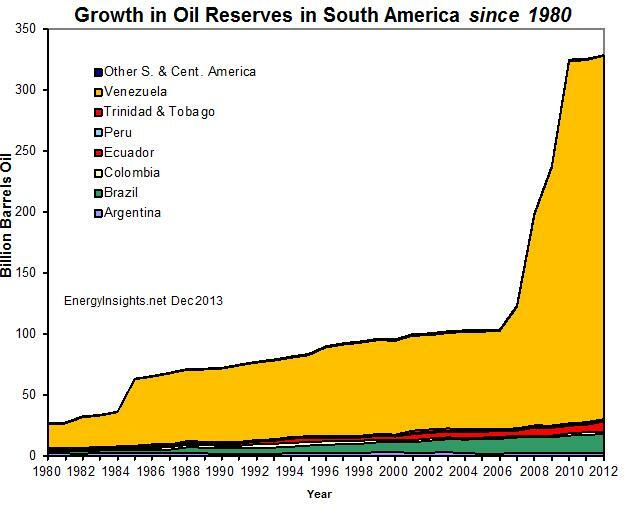 Most of the oil in South America is held within heavy oil deposits in Venezuela. 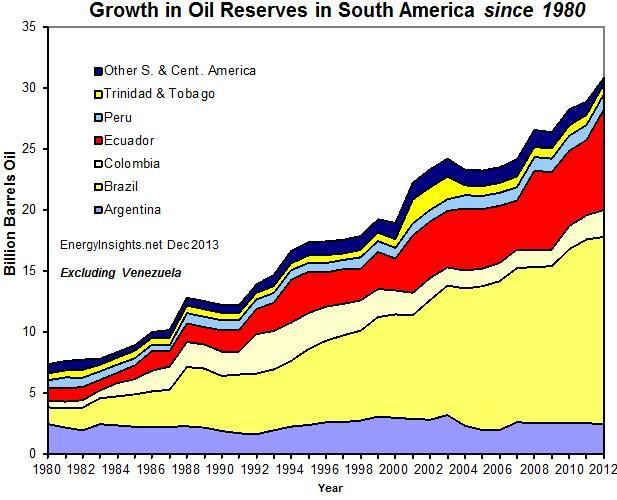 Despite Venezuela's gigantic oil reserves, oil production continues to decline from 3.3 million bbls/day in 1999 to 1.9 million bbl/day in 2012 - partly showing how much investment and organisation is required to achieve high rates in heavy oil fields. 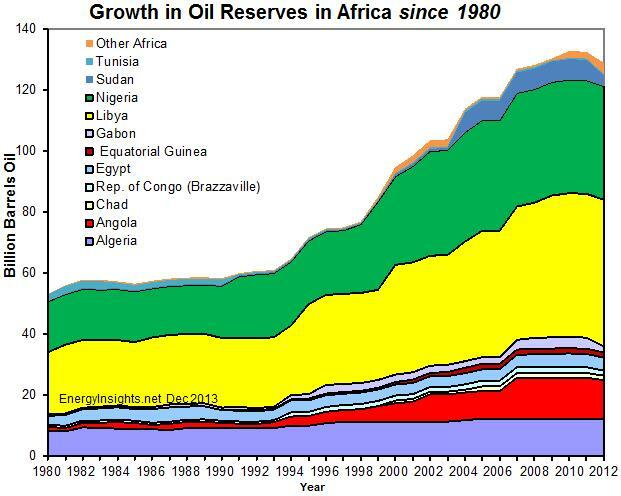 Despite a lot of new on African oil reserves increases, the actual reserves have been decreasing since 2009 - lack of investment helping drive reserves down. 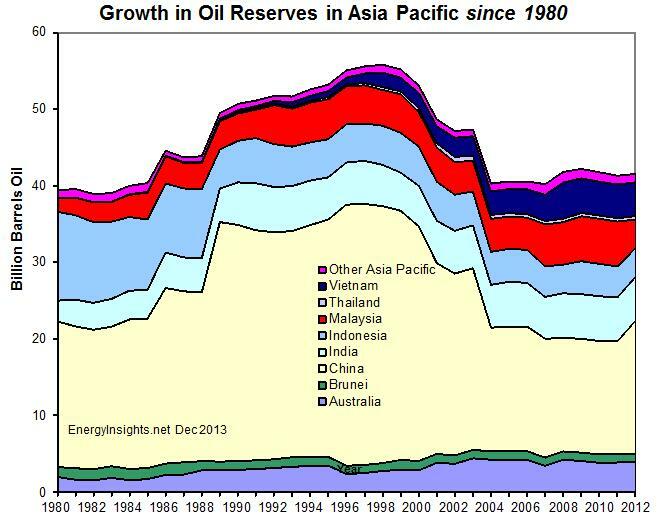 China's oil reserves are relatively low at 15 billion bbls - especially considering the population of 1.2 billion. That's only 10 bbls per person - worth $1000. They will be importing gigantic quantities of oil in future years, mainly from the Middle East. Kazakstan's oil reserves have grown dramatically with the giant Tengiz and Kashagan fields adding volumes. 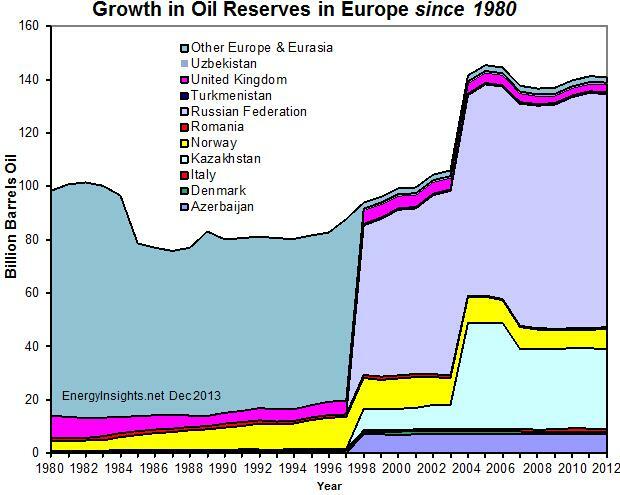 Europe continues to increase mainly driven by Russia - with a big step up in 2003 when oil prices rose above $25/bbl. 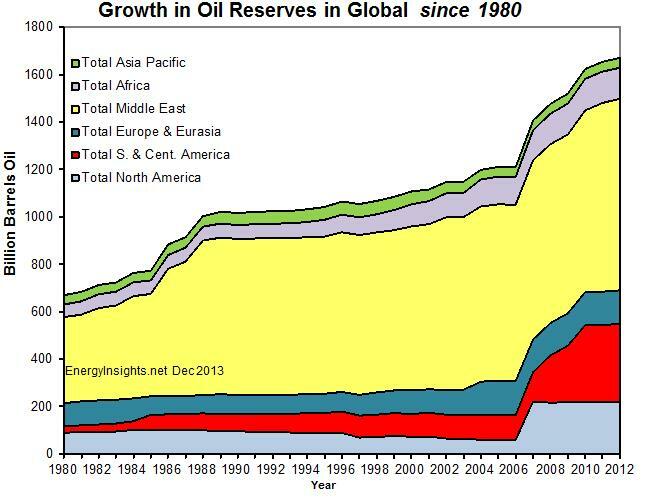 Oil reserves in all countries continues to growth as oil prices have risen. In 1985, the regional doubled its accounted reserves when the oil price crashed - though this was an artefact of scrambling to gain higher OPEC quotas that were based in claimed reserves. Iraq has about 115 billion bbls of oil reserves though production of only 2.3 million bbl/day - hence reserves are set to last a hundred years at current rates. 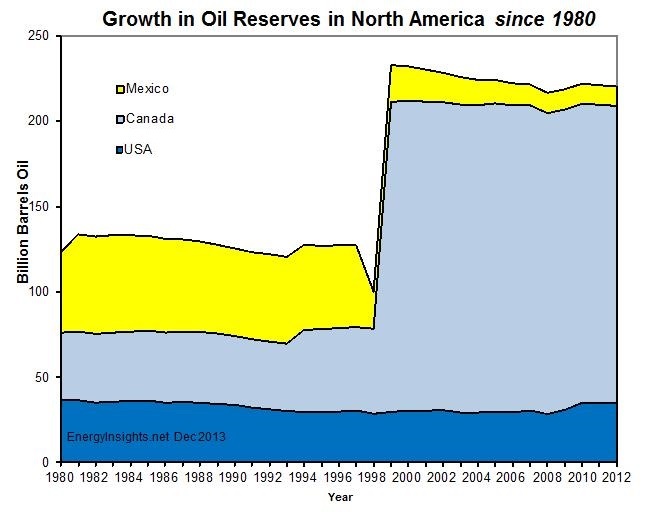 The Canada's reserves took a gigantic leap up in 1998 when heavy oil reserves were added after technical advance in extraction of such deposits.